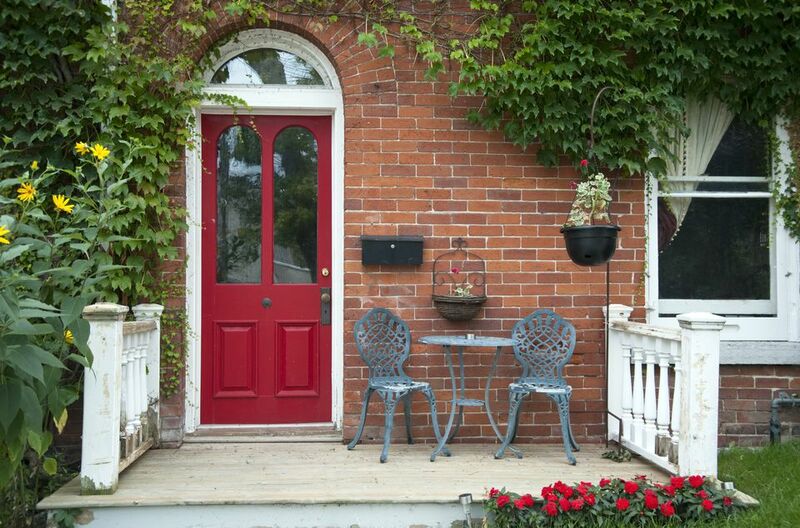 In feng shui, the front door is considered the mouth of chi or universal energy. It is through the front door that the house receives its feng shui nourishment of energy. The quality of this energy determines the quality of energy in your home. In classical feng shui, the most auspicious colors for a front door are based on the compass direction the door faces and its corresponding feng shui element. For each feng shui direction—and its corresponding element—you might choose a harmonious color or a productive (or producing) color. A harmonious color is linked to the element itself; for example, the east direction is wood, and the colors of wood are green and brown. A productive color is based on elements that produce, support, or nourish the governing element of a given direction. Productive elements for wood are related to the water element and include black, blue, and purple. To determine the compass direction your front door faces, you can use a traditional magnetic compass, but it's even easier to use a compass app on your smartphone: Open the compass app and place the bottom edge of the phone against the door while holding the phone straight out and level. The number shown with the degree symbol is the precise direction the door faces. For example, 0 degrees is directly north; 180 degrees is directly south.